Another year, another great Chicago Seminars! I had a fantastic time in Elk Grove, Illinois (about 20 minutes from O’Hare) meeting and greeting tons of other highly engaged (and slightly obsessed) frequent flyer and points hounds. I’m going to include a Flash version of my presentation below so you can flip through it at your leisure and pick up the key points I discussed, but just to give you the gist, here’s what I talked about as well as relevant links to posts with more information on various topics. 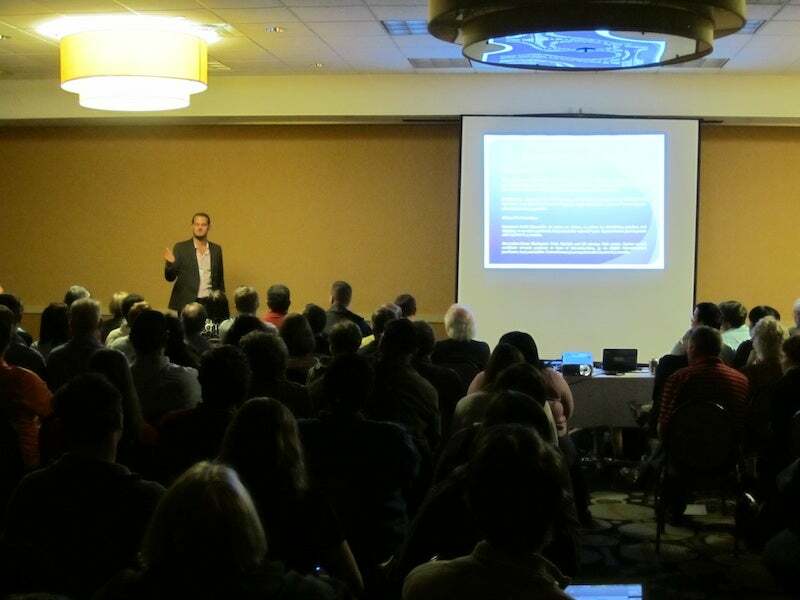 In the midst of my presentation to a packed room – thanks to all who came! I started off with the granddaddy of all transferrable points programs, Amex Membership Rewards. Among the positives of the program, I count the number of partners – both airline and hotel programs – their transfer bonuses like recent 40% and 50% ones on British Airways (though I’m still waiting for another lucrative Delta one and don’t see much hope of one coming soon), and the fact that most points transfer instantly. Among the negatives: the fact that the program is losing transfer partners like Southwest and Priority Club most recently, that it charges .06 cents per point to transfer to US airlines, and that the earning portal has been shut down for months now with no definite end in sight. I went on to single out British Airways in Oneworld, Aeroplan in Star Alliance and Delta in SkyTeam as the three airline programs to which I’m most interested in transferring Amex points. I won’t get into all the details here, but to learn more about why, you can check out my Maximizing British Airways Avios series and this post on how to redeem Avios without huge fees, as well as a few posts on Aeroplan and its pluses like flexible routing and instant transfers plus maximizing Star Alliance transfer partners. In terms of Delta, though I am anxious about the possibility of SkyMiles switching to a fixed-value program and my annoyance at their stealthy award level changes, I did point out positives like last year’s monster transfer bonuses and flexible routing options including open jaws and stopovers. I just mentioned the hotel transfer partners with my top choices of Hilton and Starwood, despite the low 3:1 transfer ratio from Amex to SPG, which even with the recent 50% transfer bonus was just a so-so transfer rate in my opinion. Moving on, I talked about maximizing category spending bonuses like the Premier Rewards’ 4x per dollar on Amex Travel purchases, 3x on airfare and 2x on gas and groceries, as well as the fact that you can transfer your points to anyone else’s account in a partner program and little-known features of the program such as advancing yourself points and even buying points. I ended this portion of my presentation with a list of my top Amex Membership Rewards cards including the and Platinum (which I don’t actually use for purchases, just for perks!). Next up was my latest points program crush: Chase Ultimate Rewards. Sure, it’s the new kid on the block, but this program has expanded by leaps and bounds over the past year, adding transfer partners like Southwest and Priority Club (straight from Amex’s former roster) and providing credit card junkies like me with a lot more ways to redeem our points. Some other pros I noted included the fact that there are no fees on any transfers, you can combine your UR points with anyone else’s, and your points post right after your statement closes. As for the cons: the number of airline and hotel partners is still limited, and the program hasn’t extended any transfer bonuses yet, so I’m just biding my time on speculative transfers. For this round, I focused on United and Hyatt as my two preferred transfer partners. As you know, I recently status matched to United Premier Platinum status successfully and have been enjoying perks like no close-in award booking or change fees plus free unlimited upgrades, as well as using my UR points for awards like first class on Lufthansa. As for Hyatt, I pointed out their low points requirements for free nights, including top-tier redemptions for just 22,000 points a night at properties like the Park Hyatt Paris Vendome, and being able to use just 6,000 points to upgrade a paid room for up to 4 nights. In terms of my favorite Ultimate Rewards-earning Chase cards, the Sapphire Preferred is at the top because of its 2x points bonuses on travel and dining and the 7% annual points dividend. Runner up is the Ink Bold thanks to its 50,000-point sign-up bonus and the ability to earn 5x points on purchases at office supply stores and utilities, as well as the 2x points on gas stations and hotels. I skimmed over Ultimate Rewards’ pay-with-points option and how to transfer points to others, plus my tips on redeeming for Chase Experiences. For the third and final transferrable points program, I covered another crowd favorite, the Starwood Preferred Guest program. Though you can redeem your points for free nights at over 1,100 properties, and even award stays count toward elite status, as do Cash & Points stays (another valuable redemption method), I also pointed out the tremendous value you can reap by taking advantage of the program’s 30+ airline partners and that 5,000-point bonus on transfers of 20,000 points to airline frequent flyer programs. To be even-handed, I did point out that transferring to others is tricky and even forbidden in some cases, that the program does not offer any other transfer bonuses, how transfer posting times vary from program to program, and that SPG unfortunately doesn’t have a shopping portal where you can rack up those points even faster. I went on to discuss some of SPG’s partner programs that you can’t transfer to from either of the other transferable programs including American, LAN and US Airways. In the case of American, I pointed out facets of AAdvantage that I personally take advantage of like low fees and the ability to book one-way awards as well as off-peak awards like just 40,000 miles to Europe, as well as mentioning a key figure for Alaska, another partner airline where it would only take 115,000 SPG points (transferred into 140,000 Alaska miles) to earn a roundtrip Cathay Pacific first class award from North America to Asia. With US Airways, I noted the number of Star Alliance partners, as well as the ability to buy miles cheaply through US Airways’ Miles Multiplier and bonuses like the current Buy and Share Miles ones; but negatives like their lack of one-way awards and a terrible web site for award searches. In terms of SPG transfers, I pointed out that you could get a roundtrip business class award ticket from North America to North Asia for 90,000 miles. So, taking advantage of both the SPG transfer bonus and the Share Miles promo, you could transfer 20,000 Starpoints to US Airways to end up with 25,000, share them to get a total of 50,000 miles (for about $325), then share those again for a total of 100,000 miles at a cost of $621. So your full price would be 20,000 Starpoints and $945. Not too bad considering those tickets generally go for $5,000-$6,000. With LAN, another Oneworld airline – I spoke about the advantage of it being the only SPG transfer airline with a ratio of 1 SPG points to 2 LAN kilometers and using those kilometers for expensive short-haul routes like Lima-Cusco for 16,000 kms roundtrip and North America to Northern South America for 48,000/100,000 kms coach/business. Probably the best example: you’d only need 28,000 Starpoints for a coach ticket to Deep South America (Chile, Argentina, etc.) or 60,000 Starpoints for business. Not bad! After a brief discussion of SPG elite membership levels, various award types and other redemptions, like SPG moments. Of course, I mentioned the two credit cards to get to bolster your SPG accounts, the Starwood Preferred Guest® Credit Card from American Express and Starwood Preferred Guest® Business Credit Card from American Express , as well as their perks like 2x points per $1 at Marriott and their current bonuses. The TPG team having fun at the post-seminars cocktail party on Saturday evening – theme shirts and all! Whew! Yes, it was a lot of information to get through, but it was punctuated with some audience question-and-answer sessions, a lot of great stories both of my own and from the folks in the audience, and all in all, a great way to spend the afternoon. This was just a brief glance, so have a look at the links I’ve included for more in-depth information on any of these topics as you flip through the presentation below – and next year, be sure to reserve your tickets to the Chicago Seminars early. Have any more questions? Feel free to leave a comment below.